One of the most genius and popular computer game of all times, Tetris, was conceived by the Russian Alexey Pajitnov in 1984. Алексей Леонидович Пажитнов (Alexey Leonidovich Pajitnov) was born on 14th of March, 1956, in Moscow, Russia. After graduation at Moscow Mathematical School Nr. 91 and Moscow Insitute of Aviation, he was hired as a programmer at the Computing Center of the Soviet Academy of Sciences, a Soviet government-founded R&D center. Pajitnov worked in the field of artificial intelligence and speech recognition. Pajitnov was interested in the field of computer games from the very beginning of his career and the Tetris was not the first game, which he conceived. Initially he created several psychology-related games. Some time in 1984 he took to his workplace a puzzle game, just bought in the "Детский мир" for 35 kopeek ("World of Children", a big children store in Moscow). The name of the game was Pentamino. It consisted of plastic 5-cube figures, just like these in Tetris. Pajitnov started to twiddle the figures trying to imagine how to implement this game in computers. First he decided to cut off a piece from of the cubes, in order to simplify the shape of figures and thus to accelerate the computer processing. Then he created a simpler computer game, called Genetic Engineering, in which the player had to move the 4-square pieces (called tetramino) around the screen using cursor keys. The player could assemble various shapes. The game however was not very successful. The breakthrough came when Pajitnov decided to drop the figures in a rectangular glass and piling up at the bottom of the glass. Two weeks later, in the beginning of 1985, the first version was ready, written on Pascal language for Electronica 60 (Электроника 60 was a russian copy of DEC LSI-11 computer). The game occupied only 2.7 KB storage memory. The name of the game "Tetris" Pajitnov combined from 2 words: the name of the original game—"tetramino" and his favorite sport—"tennis". Pajitnov was assisted in creation of Tetris initially by Dmitry Pavlovsky, his colleague from the Institute and later by Vadim Gerasimov, a 16-year-old high school schoolboy, who worked and played with IBM PCs in the Computer Center. Gerasimov ported the game for the operating system MS DOS of IBM PC (using Borland's Turbo Pascal) and was in charge of graphical design. Pajitnov, Pavlovsky and Gerasimov created a team, planning to make some dozen addictive computer games for the PC and put them together in one system, called a Computer Funfair. They also dreamed about selling the games, but this part seemed unusual and difficult in the communist Soviet Union, where making and selling something privately was a dangerous affair. 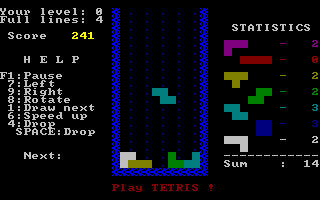 The first Tetris ran in a MS-DOS text mode, using colored space symbols to represent squares of tetraminos. The game could even automatically recognize the IBM monochrome videocard, adjusting the way it drew on the screen. The last version of the game was one of the first to use proper timer delays, in order not to run too fast on the newer and faster machines, which did almost all other games then. When all efforts to sell the games failed, the group of Pajitnov decided to give to friends free copies of all the games, including Tetris. Thus the games quickly spread around the country. 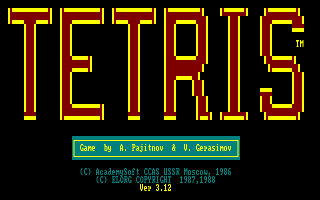 When in 1986 the freely distributed PC version of Tetris got outside of the Soviet Union and a foreign company expressed an interest in licensing Tetris, Pajitnov decided to abandon all the games but Tetris, which made Pavlovsky very unhappy and destroyed the team. 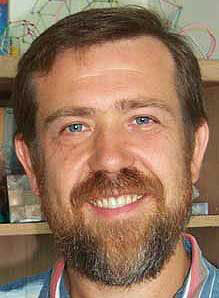 In 1991 Pajitnov moved to the United States in 1991 and later, in 1996, founded the Tetris Company. In the same year he began working for Microsoft, where worked for the Microsoft Entertainment Pack: The Puzzle Collection, MSN Mind Aerobics and MSN Games groups. He left Microsoft in 2005.